I love being all matchy-matchy with my girls. 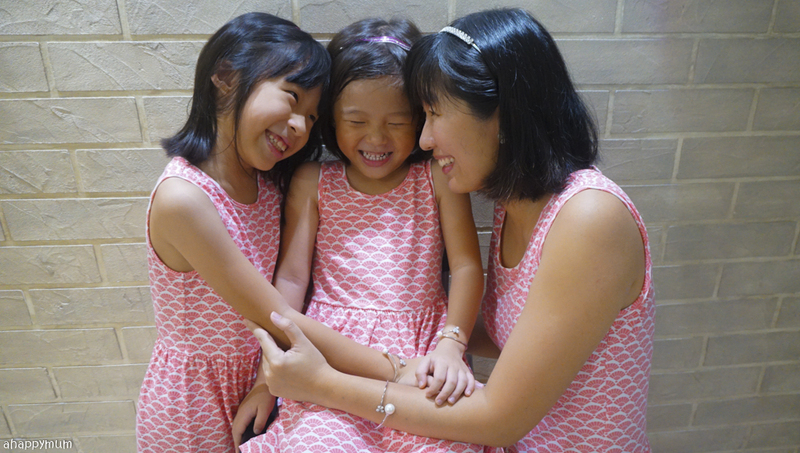 Yes, it's awesome that I have two daughters and even more awesome that they love to be all matching and coordinated with Mummy too. I mean, if we don't do it now, then when? I'm pretty sure they won't wanna do it as they get much bigger (and I get much older), so we try our best to cherish every opportunity we have now. 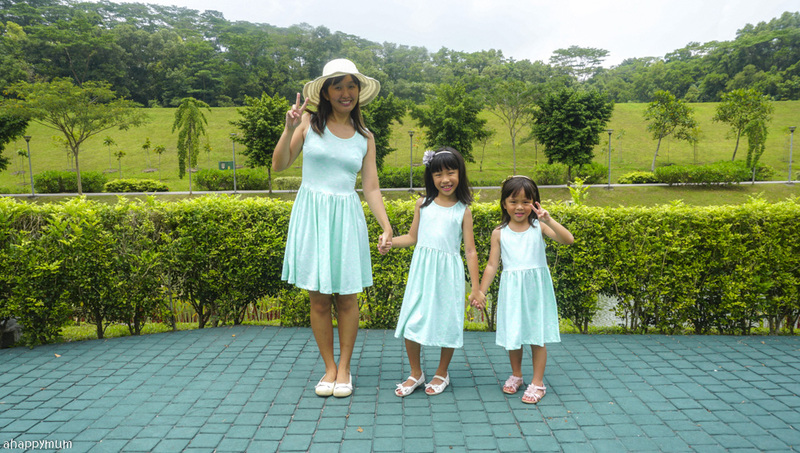 While it is not that hard to hunt for matching mother daughter outfits and we usually go for one-piece dresses, it is rare that we find any mother-daughter matching accessories. 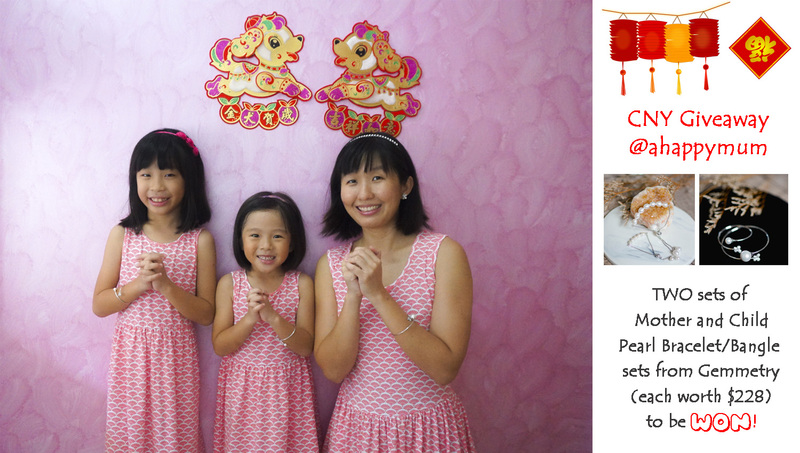 Wouldn't it be nice to add some sparkle for Mummy and her girl, especially now that Chinese New Year is around the corner? 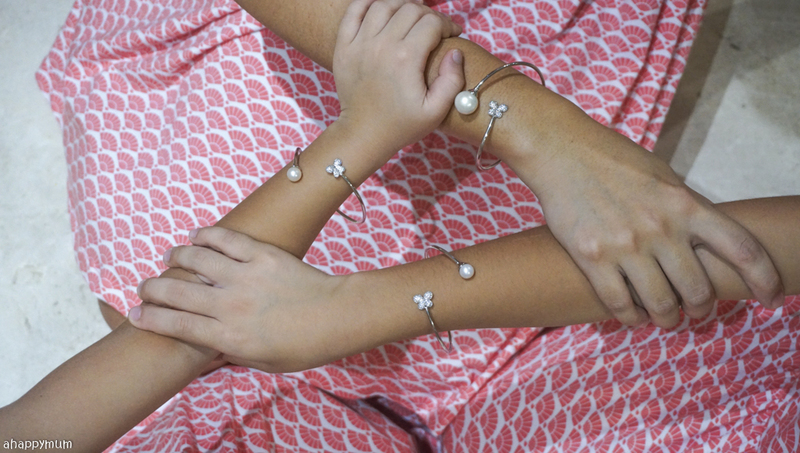 When Gemmetry introduced me to their catalogue and showed me the Mother and Child Freshwater Pearl Bracelet and Bangle sets, I was stoked because this would be the first time I could wear matching jewellery with my girls. Let me show you more of our beautiful pieces and for those who would love to win a set for you and your child, I have not one but TWO Mother and Child Bracelet/Bangle sets (each worth $228) to be given away too. So read on! 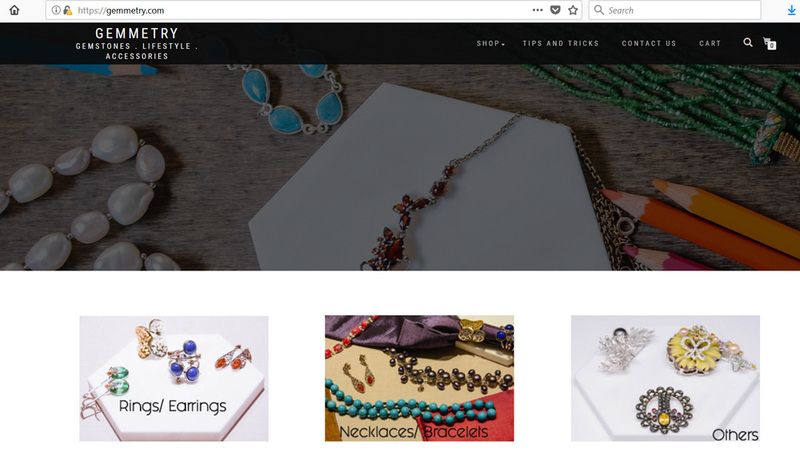 Gemmetry is a local startup and online retailer that offers a range of unique gemstone accessories as well as lifestyle products. These include rings, earrings, bracelets, necklaces, brooches, pendants, keychains and more. Every product goes through a meticulous selection process in order to ensure quality and affordability. 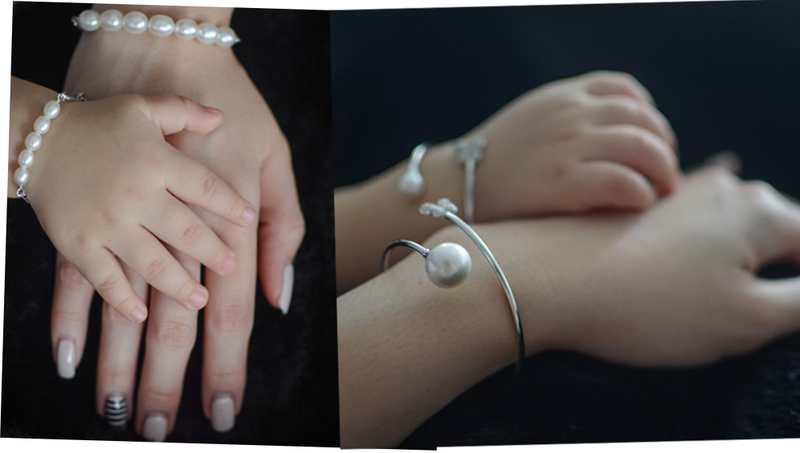 What most excites me is their recent launch of their Mother and Daughter collection - the first part of the launch is focused on pearls and consists of the above freshwater pearl designs. Now, I've never been extremely fond of pearls because I assumed they make me look a tad more old-fashioned. However, these exquisite designs proved to me that with the right amount of pearls and a beautiful design to chain it all together, pearl accessories can exude so much elegance and beauty, making you shine without the need for excessive bling. On the left is the Bracelet set and each comes with four freshwater pearls and an adjustable cord for easy wearing. It is a striking, eye-catching design which is well-suited for parties, celebrations and events. On the right is the Bangle set which has a more subtle but classy look and comes with a single pearl matched with a butterfly motif topped with cubic zirconia- a synthesised crystalline material that is an affordable alternative to diamonds, with its similar shine and clarity. I showed the girls the options and the three of us unanimously chose the Bangle design. For me, it's because I personally prefer a subtle, timeless, classy look and for the girls, I'm quite sure it's because of that beautiful, shimmering butterfly. Our matching bangles arrived in this beautiful jewellery box which opens up effortlessly and comes with push studs to keep the bangles in place. The bangle is made of 925 silver and it is a flexi band which allows you to tighten and loosen with ease and you can easily adjust it to your preferred size. You can simply wear it around the wrist or loosen it a little and go for a forearm bangle look too. There is only one size for adults but for kids, you can choose from either the newborn set (suited for newborns up to 4 years old) or the child set (suited for girls from 5 to 12 years old). This is how the bangles look on us. Lovely, aren't they? Both Angel and Ariel are wearing the same sized child bangle so having a flexi band really helps me to adjust according to their sizes. I'm pretty sure they can continue to wear these for many years down the road and if they last as long and as well as I hope they will, it's surely a good and worthwhile buy considering that these bangles don't burn that big a hole in the pocket. If you would like to get the bangles or bracelets for your child only, you can also get them separately from Gemmetry instead of having to get the Mother and Child set. It's nice to see the girls being able to twin not just in their dresses but in their accessories as well! We are definitely excited to wear these beautiful, matching bangles to go 拜年 during the upcoming Chinese New Year! Yes, we can all do with some glitter during this festive season and I'm glad we will be adding a touch of sparkle together. As mother and daughters. To find out more about Gemmetry, visit their website and follow them on Facebook. From 25 Jan to 28 February, key in the coupon code CNY18 when you check out and enjoy 15% off all products and free shipping too! Good things must share! 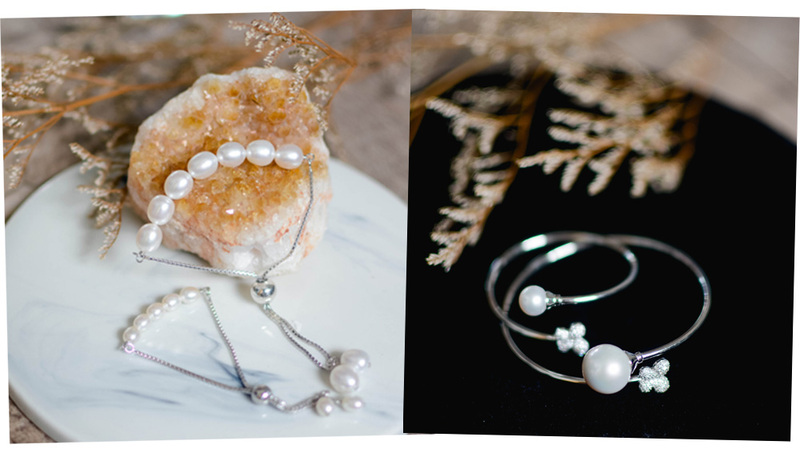 That is what I always advocate so here's an awesome giveaway where TWO of you will stand to win a Mother and Child Freshwater Pearl Bracelet OR Bangle set (each worth $228) from Gemmetry! 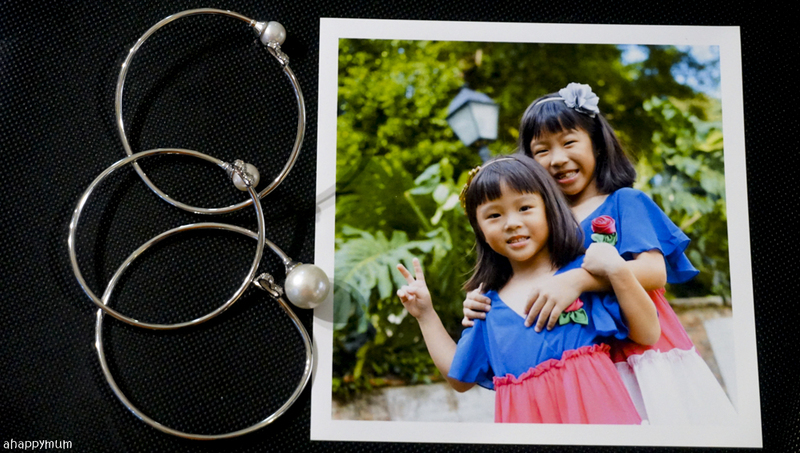 *For the kids' sets, note that the Pearl Bracelet only comes in Newborn size (for newborn to 4 years old) but the Pearl Bangle comes in either Newborn size or Child size (for 5 to 12 years old).This giveaway is open to all Singapore residents with a valid address for delivery and aged 18 years old or older. To join in this giveaway, leave a comment in this post with your name, email address and choice of either the Bracelet or Bangle set. Indicate in the widget that you have done so and to increase your chances of winning, you can choose to carry out the rest of the options. Best of luck! 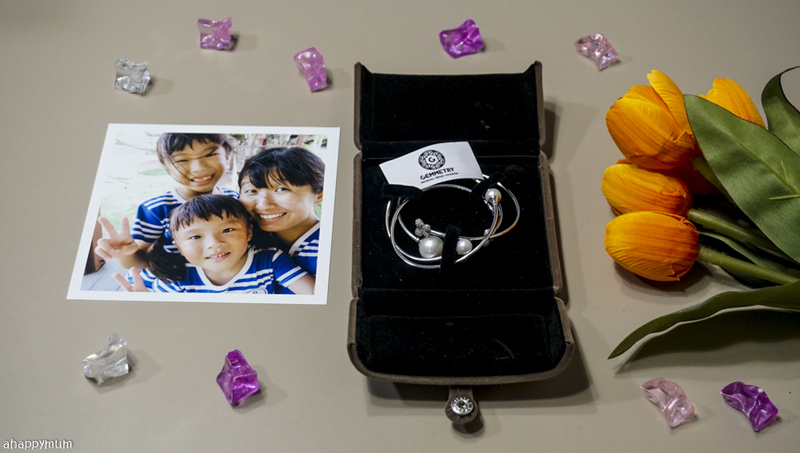 a Rafflecopter giveaway Disclosure: This is a sponsored review for Gemmetry and we received the Freshwater Pearl Bangles in writing this post. Product images are provided by Gemmetry and all other photos belong to us. All opinions are our own. Bangle set please! Thank you for the giveaway! I would like the bangle set also. Would love to win the Bangle set please. It’s so pretty and it’s love at first sight. my choice is the Pearl Bracelet . Pearl Bracelet please, too pretty! Hope to be the lucky winner. Thank you for organising this giveaway! Like the pretty bracelet set please! Liked and followed on 3 platforms! Would love to win the bangle set.